Shown above: At The British Museum, London – Planning to travel with a child 3 to 4 years? Don’t rule out visits to big museums on your urban adventure—my preschooler could have spent a solid hour in just this “clock room” alone. For many families, this is the year when travel becomes significantly easier, especially with the completion of potty training and the child’s improved ability to express himself. Your preschool-age child may also crave more social interaction than ever before, so trips to campgrounds that are popular with families and stops at playgrounds and parks where other children may be can help provide this outlet. Also, “3 years and out of diapers” is often the magic formula for children to qualify for most kid’s programs, clubs, and activities at many family resorts and on cruise ships, giving them supervised creative playtime with their peers while you get a chance to snorkel, shop, visit a museum, or take a nap by the pool. Home stays with friends and family also get a little easier now as your child has a better understanding of some basic safety concerns (e.g., we don’t eat the Christmas tree ornaments). Although the largest theme parks may still be overwhelming this year (few children this age have the patience to wait in one line after the next), your child will likely enjoy visits to aquariums, natural history or science museums with interactive children’s displays, and zoos. 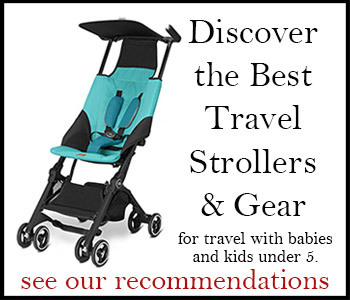 Your load lightens as less gear is needed, though you may end up having to carry an exhausted child if he begins to refuse his stroller this year (if this sounds all-too possible, consider this clever child carrier for kids up to 50 lbs–thanks for helping to support this site with your click through!). Your child may no longer take a regular nap at home, but you may find he desperately needs one to keep up with all the excitement and activity of fun-filled family vacation. Be sure to schedule some down time throughout your vacation, whether that results in an actual nap or just a restful retreat. Cruises (see Part VII: Travels by Cruise Ship of Travels with Baby and you may also like Five Things You Should Know Before Planning a Cruise with Kids). Resorts with kids’ camps for 3 years and older—as long as you’re sure your child will be potty trained (see Best Hotels and Resorts for Young families and Best All-Inclusive Resorts for Children Under 5 in Travels with Baby). Home stays with family and friends (see section beginning on pg. 60 of Travels with Baby and Staying Safe [and Sane] with Friends and Family). San Diego offers a good mix of toddler-friendly activities, with built-in beach fun, a zoo, an aquarium, and the fun of fountains and kiddie rides in Balboa Park. See How to Stretch Your Family Vacation Dollars in San Diego and see more ideas on my San Diego with Little Kids board on Pinterest. Scrubba-dubba-doo, just 3 to 5 minutes a load should do.